So, is the EU jumping up and down with glee at the prospect of indicative votes in Westminster on Wednesday? For months, even years now, Brussels has been urging the UK to "tell us what you want, what you really, really want!" And yet there is no sudden outbreak of Brexit joy across the Channel. EU governments know well enough by now that Wednesday's votes may not end up providing a clear picture of Brexit. Even if they did, European Commission chief Jean-Claude Juncker will point out that the EU's only "interlocutor" – or opposite number – remains Her Majesty's government, led by Theresa May, and not UK MPs. Would she be willing to shuttle as a go-between on behalf of Parliament, which has chosen to ignore her negotiated Brexit deal? So the EU sees yet more uncertainty ahead. And that's bad for business, off-putting for international investors, it costs a fortune in no-deal planning and can affect opinion polls in European countries most affected by Brexit. Which is not to say the EU prioritises certainty enough to pursue a no-deal Brexit. Some in the European Commission may feel that way, along with a number of European diplomats based here in Brussels. They say they are fed-up with the UK's Brexit chaos infecting the rest of the continent. They speak with yearning of EU life after Brexit, and describe a no-deal scenario as "damaging" and "suboptimal" – but ultimately something the EU will survive. One of the favourite statistics doing the rounds it that, while the UK relies on the EU for 49% of its trade, only around 10% of EU trade is with the UK. But this "bring-it-on" attitude towards no deal is very much absent in European capitals. As we saw at last week's summit, EU leaders believe it in their interest to avoid a no-deal Brexit. Or, at the very least, to avoid being blamed in the worst-case scenario. As one high-level Brussels official put it: "We want to be seen to have made the maximum effort so that, if the UK doesn't find a Brexit solution, it's not because of us." It's also a fool's errand to go searching for rifts between EU countries over Brexit at this stage. MEPs are not very relevant here. It's the national leaders of the 27 EU countries that count. And amongst them, as (pretty much) always, it's the net payers into the EU budget that hold most influence. Germany and France above all. Angela Merkel and Emmanuel Macron also have their domestic audiences in mind when they speak about Brexit. Their parties are contesting fast-approaching elections for the European Parliament too, and their political styles are intentionally very different. At last week's summit, for example, Emmanuel Macron was happy to play "bad cop" on Brexit, according to one EU diplomat I spoke to. Angela Merkel generally prefers to appear more conciliatory. Tempting as it may be to look for clear black and whites in the EU, when UK politics is such a mess, European opinion is nuanced too. But the big players are not pulling in wildly different directions. They are united in preferring to avoid a no-deal Brexit if they can, in wishing that Parliament would pass the prime minister's negotiated Brexit deal - sooner rather than later - and in hoping for a close relationship with the UK on the other side. An inconclusive second referendum or general election would be a nightmare for the EU – keeping Brexit looming over EU affairs for the foreseeable future. Revoking Article 50 is described in Brussels as "the nuclear option" and is viewed as very unlikely as things stand. For now the EU does as Theresa May does: it takes one Brexit week, one Brexit day at a time. Brussels has told the prime minister if she is unable get her deal passed through parliament by 12 April, she needs to give them several days' warning as to what her Plan B might be. Few in the EU think she has one. 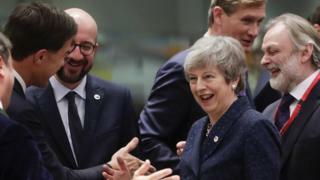 EU leaders are pencilling in a possible Brexit summit around that time, in order for the prime minister to request a longer Brexit delay – or another short one until 22 May, to get the deal passed or to make last-minute preparations for a no-deal Brexit. Ask EU diplomats and officials about their plans beyond that and they start to go a bit cross-eyed.